Enceladus is one of Saturn's 62+ moons. The voyage of the Cassini spacecraft has yielded an abundance of information about Saturn and its moons. This grayscale image of Enceladus is from NASA/JPL/Space Science Institute. Information from the original picture caption: "Saturn's moon Enceladus reflects sunlight brightly while the planet and its rings fill the background of this Cassini view. Enceladus is one of the most reflective bodies in the solar system because it is constantly coated by fresh, white ice particles. This view looks toward the anti-Saturn side of Enceladus (504 kilometers, or 313 miles across). This view looks toward the northern, sunlit side of the rings from just above the ringplane. The image was taken in visible light with the Cassini spacecraft narrow-angle camera on Dec. 21, 2010. The view was obtained at a distance of approximately 102,000 kilometers (63,000 miles) from Enceladus." This image is from NASA's Cassini spacecraft. "Enceladus is one of the brightest objects in our solar system. Covered in water ice that reflects sunlight like freshly fallen snow, Enceladus reflects almost 100 percent of the sunlight that strikes it. Because Enceladus reflects so much sunlight, the surface temperature is extremely cold, about -201° C (-330° F)." "About as wide as Arizona, Enceladus is quite similar in size to Mimas but has a smoother, brighter surface. 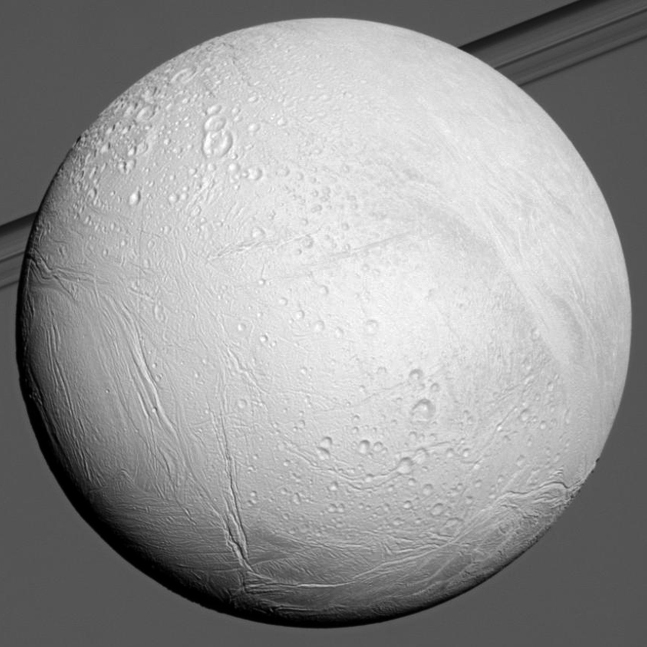 Unlike Mimas, Enceladus displays at least five different types of terrain. Parts of the moon show craters no larger than 35 kilometers (about 22 miles) in diameter. Other areas show regions with no craters indicating major resurfacing events in the geologically recent past. There are fissures, plains, corrugated terrain and other crustal deformations. All of this indicates that the interior of the moon may be liquid today, even though it should have been frozen eons ago. Enceladus' surface is believed to be geologically "young," possibly less than 100 million years old." Enceladus along with Titan and Europa has drawn the attention of astrobiologists who are looking for evidence of life beyond the Earth. NASA/JPL/Space Science Institute Unusual features of Enceladus include large water geysers spewing icy water hundreds of kilometers into space. This material forms one of Saturn's fainter rings, the E ring, and also rains down on the planet, according to Drake. The discovery of the giant water fountains of Enceladus solved the mystery of why water was being detected in the rings of Saturn. 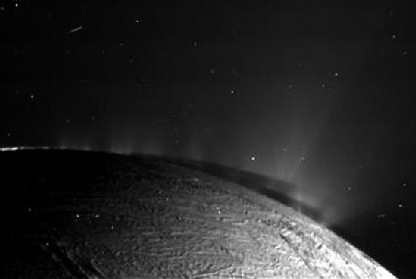 The water plumes show that there is subsurface water, contributing to the interest in Enceladus as a possible location for life. There are at least 70 jets bursting from fractures at the south pole. 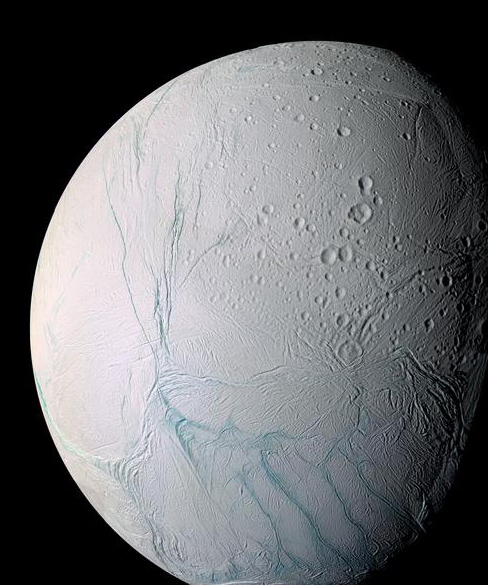 Enceladus has water, organics, nitrogen, and an energy source. At present, it is the only other place in the solar system besides Earth that has all four of these necessary precursors for Earth-type life. "Alien-life hunters focus on moons in outer solar system", Nadia Drake, Science News 180, #8, Oct 8, 2011, p22.